LogCombiner allows you to combine log and tree files from multiple independent runs of BEAST. It can be run with a user-interface or as a command-line utility. LogCombiner is a program for combining the output from multiple runs of BEAST and for other processing tasks. This combo menu allows you to select either the log or tree file type that you will be importing into LogCombiner. BEAST will often write numbers in scientific notation to maintain precision. Some software programs may have problems with this, so this option will convert these to decimal numbers. 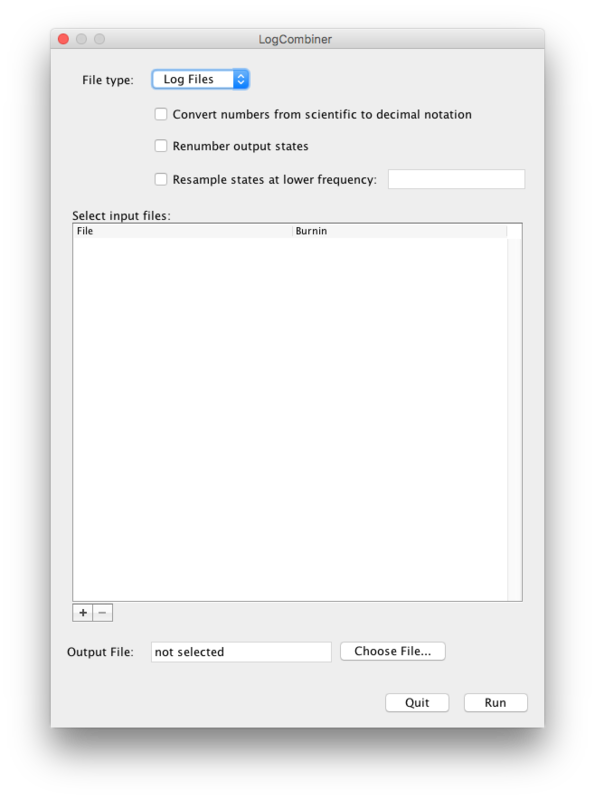 If selected, this will renumber the output states to a sequential series. This option allows you to resample your posterior distribution at a lower frequency than in previous BEAST runs. This should be specified as a multiple of the existing sampling frequency (i.e., if your original file sampled every 1000 states, you could change this to 2000, 3000, etc.). Here you can select using the “+” button the input files that you wish to combine (or just select one if you wish to just change the file using the options above). These will appear in the sub-window with the file name and the BurnIn period. To determine a suitable burnin for each individual file, it is advisable to check each independently in Tracer. Warning: The files you have selected must be from independent runs of BEAST from the same XML file. If the log files differ an error will occur stating that the number of columns in the first file does not match that of the second file. This option allows you to select a new log file that the combined log data will be saved to. Combining trees files can be much slower than log files due to the large size of these files. When the program says ‘Finished’, the combined log file you selected, above, will be ready. Close the program by selecting the Quit option. Once LogCombiner has finished you can analyse the combined log file in Tracer. There are some options (scale & strip) that are not available in the user-interface. On the other hand with the command-line interface it is not possible to specify different burnins for different files (although it would be possible to process each in turn, removing an appropriate burnin and then combining the resulting files — you would then use a burnin of 0). Just typing logcombiner with no additional options will bring up the user-interface dialog box.